Cartier is no stranger to the art of fine watchmaking, and in the last few years the French maison has been bringing the haute …err… heat to the world of high horology, with watches bearing the Geneva Seal – like the Drive de Cartier Flying Tourbillon. 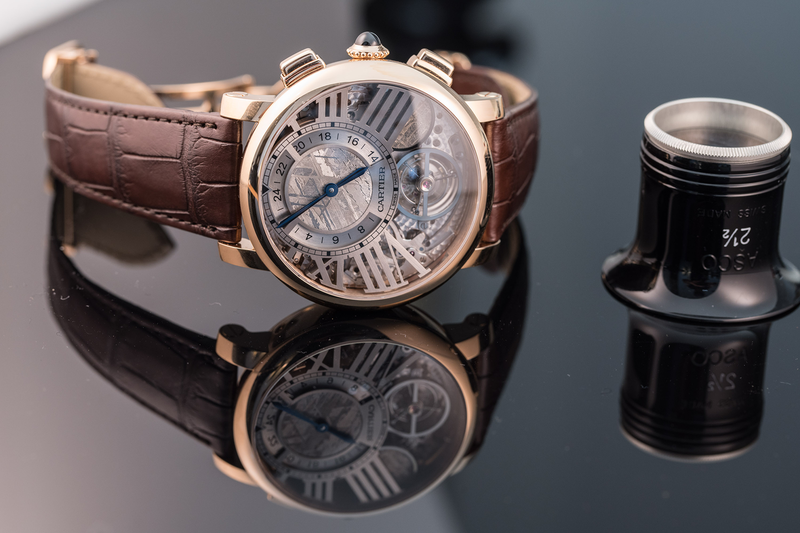 In 2014 Cartier first introduced us to the Rotonde De Cartier Earth and Moon in platinum, and this year with a case and dial change it has reunited the Earth with the moon and added an 18-carat pink-gold-cased version, which is limited to 15 pieces. Where the first version was a stylised tribute to the Earth, this is an ode to the moon. The original’s earthly blue lapis lazuli discs have been replaced with meteorite and the dial is now “open-worked” – further exposing the tourbillon at six o’clock. The 18-carat white-gold hour markers also surround the off-centre meteorite disc, which forms a subdial and houses the classically Cartier blued-steel hands used to display the time. But that’s not all. Between the meteorite disc and the railroad minute track sits a 24-hour ring, allowing for a second time-zone display, which is adjusted independently, simply by using the pusher at 2 o’clock. And we still haven’t got to the best part. With this being the Earth and Moon watch, in addition to the terrestrial display, there is also a lunar display. Look closely and you’ll see another meteorite disc that’s partly obscured at four o’clock, only fully coming into view with the use of the second pusher, at which point it swings down to eclipse the tourbillon and the remaining visible portion is an accurate representation of the phase of the moon – impressive, right? This creative twist on a very traditional complication is the brainchild of Cartier’s head of movement design, the legendary Carole Forestier-Kasapi. 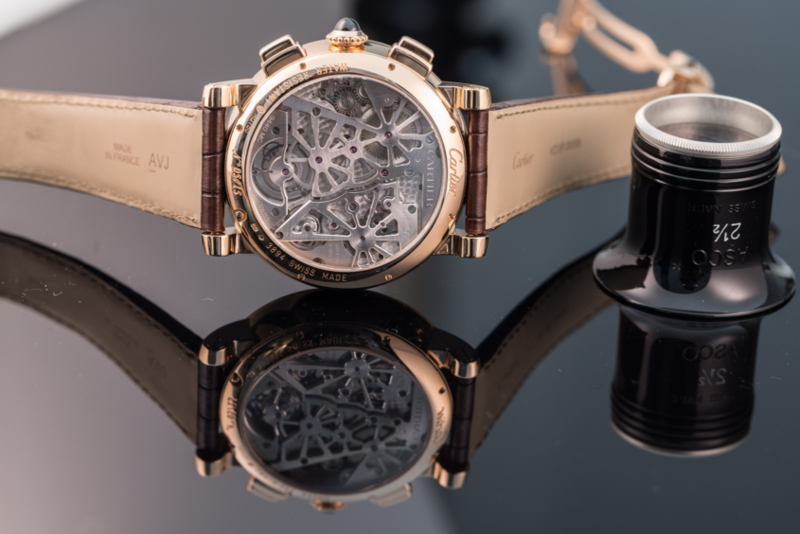 The pink-gold case measures 47mm across and 16.65mm thick. On the side sits a beaded pink-gold crown, set with another Cartier hallmark – a large blue sapphire cabochon – while on the inside sits the manually wound calibre 9440 MC, with a power reserve of nearly three days. The movement is clearly visible through the sapphire crystal display back, and its series of excellently finished star-shaped bridges echo the celestial theme. Appealing to a world obsessed with on-demand everything, this clever take on the romantic moon phase complication paired with Cartier’s own watchmaking design codes showcases the manufacturers dedication to modern fine watchmaking.